The ‘Casetta Media’ is located in south-west direction and has sun the whole day. The property is typical Mediterranean and there is a lot of space unwind in an informal environment. The house consists of a spacious, well furnished living room/kitchen area which has also a sofabed, a double room and a bathroom. From there you can reach the outside area which has a meadow and terrace, eating table and sunloungers. Here, up to 4 people can live in a very comfortably. The small guest house is located in the back-country of the Etruscan coast in southern Tuscany. It is a lovely place. Many guests love to come back again. The manor with its 3 individual and comfortable apartments is located in a very quiet place. There are no noisy streets. 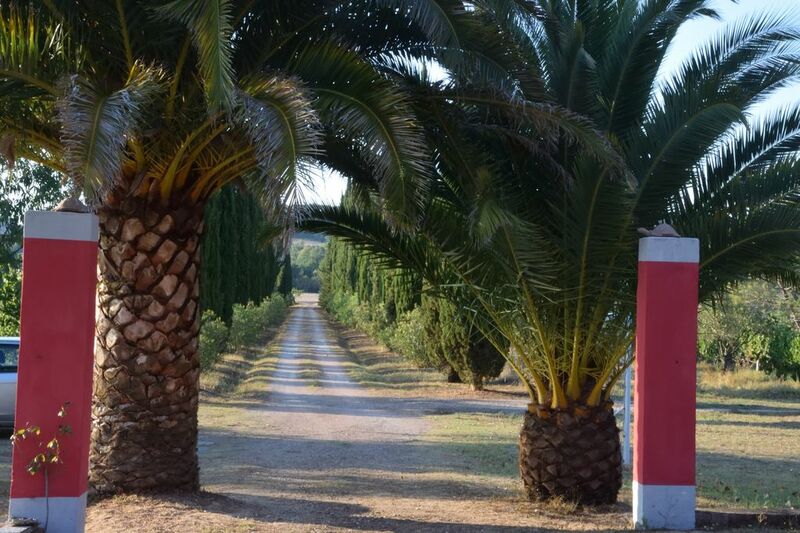 It is surrounded by wine yards and olive groves. Quiet lanes and paths go in all directions. On its quiet way it is just 20 km in western direction to reach the sea. The wide km long beaches are rugged and untouched. There are soft sandy beaches around Follonica and also lonely bays and rock coast at Barattil/Populonia. Not far away is the next village Suvereto. There you have plenty of shopping facilities and different bars and restaurants. It is easy to reach historic places like Siena, San Gimignano, Pisa and Massa Marittima. Biking holidays/cycling holidays - free bikes: Discover the Etruscan Coast by bike. Biking for everyone. Every year, a lot of keen bike lovers from all over the world come to our region. It is a variety of cycling guests, or people who seek rest and also professional ones. They cycle daily over the flat field lanes to the sea. They also drive over streets which have not much traffic to visit different places and small villages. It is fun to explore the region by bike. The guest house is the starting point and is located on a height of 70 m. In direction of the coast the area is flat but the more you get into the countryside the higher and steeper it will be (up to 700 – 800 m). The sun is shining a lot. There is only rain during the winter. From March to the end of October it is dry and warm. A lot of months the area is dried up. You are welcome to use are mountain and trekking bikes, tandems and kid's bikes, like new and well maintained, during your entire stay and for free! Professional cycling: Professional cyclists will find ideal practising conditions and this nearly during the whole year. We have warm and dry climate and also beautiful and streets without much traffic. There are interesting routes with different distances. Professional cycling is very popular at the local population, especially at the weekends and during the holiday period. Everyone can then be found on the streets. Cyclists enjoy a lot of respect and care among car drivers. Wild back-country/nature park of Montioni: The guest house is directly adjacent to the nature par of Montioni. From here you can easily discover the endless paths and forest walks on foot or by mountain bike. We will provide good maps and informations about the area on site. The park is a wide, almost uninhabited area with original Macchia Mediterranea. From small slope you always have a nice view of the sea. With a little patience and luck you will be able to watch wild animals. Especially interesting are the variety of birds, tortoises, porcupines, boars, deer and stags, as well as harmless vipers and lizards. On the other end of the park, close to Massa Marittima, there is an unique turtle farm where you can see hundreds of small and large tortoises and terrapins from Mediterranean and tropical countries. If you wish we will prepare you a daily, rich, full-value breakfast of your choice. Had a fantastic time in Tucany. The Toscana Guesthouse is an ideal base for exploring the many hill towns and beautiful Tuscany countryside. The fine sandy beaches of San Vincenzo are just a short drive, as is the charming town of Suvereto with it's charming restaurants and bars. The holiday was made complete by the excellent accommodation on this working vinyard with it's quiet location, clean and comfortable facilities and the friendly hospitality of the owners, Anna and her husband. Alles da was man braucht, herrlich ruhig. Wir hätten uns nicht wohler fühlen können! Ruhige Lage in ländlicher Umgebung, in der die Erholung ein Muss ist. Florian ist ein Vermieter mit Herz und Verstand. Ein Gewinn, ihn kennengelernt zu haben. Schön, in ruhiger Lage gelegen überzeugt das Konzept . Jede Unterkunft hat eigenen Gartenanteil mit Privatsphäre. Der Vermieter ist aufmerksam und erfüllte auch Einkaufswünsche. Der einfache , natürliche Wein schmeckt. Das am Hof erzeugte Olivenöl ist ausgezeichnet. Florians Gästehaus liegt inmitten der toskanischen Hügel, weit ab vom Trubel des Massentourismus. Es ist komfortabel eingerichtet und mit allem Nötigen ausgestattet. Bei der Ankunft erwarteten uns in der Küche zwei Flaschen von Florians Wein und eine Karaffe seines köstlichen Olivenöls. Das Gästehaus ist sehr ruhig gelegen, etwas abseits von der Landstrasse, eigentlich ideal für alle, die mal wirklich abschalten und richtig entspannen wollen. Von Calzalunga aus kann man Autofahrten oder Radwanderungen in die Maremma unternehmen, wunderschöne mittelalterlichen Städtchen wie Suvereto, Campiglia Marittima oder Massa Marittima besichtigen oder die toskanischen Hügel mit ihren sich schlängelnden Straßen erforschen. Die Küste liegt etwas weiter entfernt, aber herrliche Strände sind trotzdem erreichbar, etwa bei der Baratti-Bucht. Florian steht seinen Gästen mit Ratschlägen zur Verfügung und ist praktisch immer erreichbar. Man fühlt sich von ihm wirklich als Gast, sehr freundschaftlich, behandelt, bekommt Trauben und Tomaten, darf Feigen und Mandeln pflücken und bei einem abendlichen Glas Wein erzählt er gern Interessantes über Land und Leute. Zum Haus gehören natürlich auch Katzen, was für uns Katzenliebhaber ein klares Plus war. Wir können Florians Gästehaus wärmstens empfehlen und werden noch lange an die schönen Tage in seinem Gästehaus bei Calzalunga zurückdenken. Suvereto is a small community and has 3000 inhabitants. Around half of the population lives in the countryside and the other half in the named village. The village which is surrounded by a wall is of old origin. It is on an elevated location with beautiful view at the coast area up to the sea. In this area, wine and olives are cultivated for many centuries and even today it is the main income of the local agriculture.